"We, the sensible people of the United States, in an attempt to help everyone get along, restore some semblance of justice, avoid any more riots, keep our nation safe, promote positive behavior, and secure the blessings of debt free liberty to ourselves and our great-great-great-grandchildren, hereby try one more time to ordain and establish some common sense guidelines for the terminally whiny, guilt-ridden, delusional, and other liberal, bedwetters. 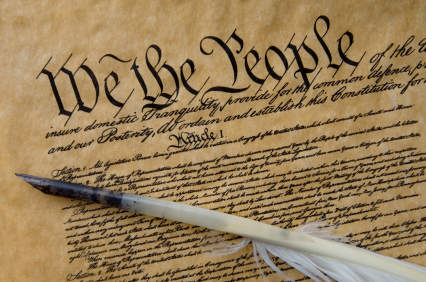 We hold these truths to be self-evident: that a whole lot of people are confused by the Bill of Rights and are so dim that they require a "Bill of No Rights." ARTICLE I: You do not have the right to a new car, big screen TV or any other form of wealth. More power to you if you can legally acquire them, but no one is guaranteeing anything. Earn your own money for your toys. ARTICLE II: You do not have the right to never be offended. This country is based on freedom, and that means freedom for everyone --not just you! You may leave the room, turn the channel, express a different opinion, etc., but the world is full of idiots, and probably always will be. ARTICLE III: You do not have the right to be free from harm. If you stick a screwdriver in your eye, learn to be more careful; if you shoot yourself, don't blame the gun manufacturer. Burn yourself with coffee...read the label and don't drink the stuff while you're trying to weave in and out of traffic. Do not expect the tool manufacturer to make you and all your relatives independently wealthy because you cut your finger with their product. and do not want to spend so much of our time battling each and every little tyrant with a military uniform and a funny hat. ARTICLE X: You do not have the right to happiness. Being an American means that you have the right to pursue happiness - which by the way, is a lot easier if you are unencumbered by an overabundance of idiotic laws created by those of you who were confused by the Bill of Rights."